My introduction to William Blake came through a copy of Songs of Innocence and Experience, lent to me by a high-school friend. Over the course of a few weeks, I read it through and through, enchanted by its elegant simplicity. Visually, it had the magic of a book of fairy tales, yet its perfect verse – a mix of hymn, nursery rhyme, and ballad – spoke to the mature listener. This was a book from a different era, with its own norms, but in mine, I had not yet encountered such a juxtaposition. I admittedly became a ‘Blake-head’, and though I went on to immerse myself in his extraordinary body of work, I have since returned again and again to this songbook with great joy. 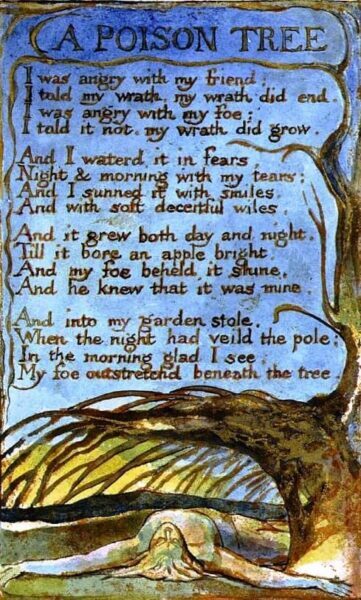 As it does to so many Blake admirers, ‘A Poison Tree’ has always stood out to me amongst the collection’s poems. Blake placed the moral at the beginning, in a uniquely metered quatrain that serves as a rhyming proverb, complete even if read apart from the rest of the poem. Its meaning is simple: Speak your anger and it will dissipate, but bury it and it will grow. More so, voicing your anger is natural and perhaps preferred when directed at friends. With enemies, though, the opposite is true. It is from this second scenario that the dark narrative of the poem develops, laden with metaphor. In short, it relays that suppressed wrath can grow like a tree, which may one day bear a poisonous, yet tempting, fruit. Around this tree the fates of the speaker and his foe intertwine. Though Blake spoke to the conscience of his own time and culture, what makes ‘A Poison Tree’ appealing to so many is his use of universal imagery. With basic, easily recognized, and relatable symbols (friend, foe, anger, tears, fears, forbidden fruit, etc. ), Blake tells an intriguing parable that is left open to interpretation. It is applicable across all cultures and eras, conveying a struggle that is common to all mankind. That these are works of a musical nature is evident, and as a composer, I have always found it hard to read this collection without imagining the kinds of melodies Blake might have paired with his words. In keeping with his storybook design, I hear them as simple, memorable songs, at times sweet, and at others, sinister. They might be sung in a playful voice, and when accompanied, illustrated by a vivid musical texture. 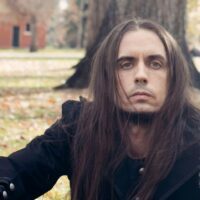 It is in this manner that I therefore approached the poem, when, while writing and recording my band Astralingua’s upcoming album Safe Passage, I elected to set ‘A Poison Tree’ to music. I used a basic ABAB form, alternating keys, and wrote the melody to be catchy, slightly taunting, and with enough space and pause throughout for the consideration of each line. Imagining the song as something that a band of minstrels might play before a royal court – a theatre piece of sorts – I coloured it with mandolins and lutes, hoping to conjure in the mind of the listener a sense of the Old World that serves as the setting for many a fairy tale. I aimed for a version that would be fun and entertaining, yet still contain a deep message for the King to ponder. Though only four stanzas long, ‘A Poison Tree’ is a poem of many layers, and fits well within the overarching themes of Safe Passage. The album discusses mortality, isolation, struggle, and the movement between worlds, all the while asking the questions: What is Safe Passage? From where to where is it granted? Who or what provides it? Who denies it? ‘A Poison Tree’ drives further this enquiry with its enigmatic tale of wrath. Is the narrator consumed or satisfied by his anger? Does the unsuspecting foe simply fall prey to a the narrator’s trap, or is it his own corrupt thirst for the ‘shiny apple’ that is his undoing? For what else is this narrative a metaphor? Finally, the duality of worlds operating within the poem – that of the schemer and that of the deceived – are mirrored in the other songs of Safe Passage, which intimate dreams within dreams and parallel realities dissolving into each other. It has pleased me to no end that I should find such occasion to incorporate something of Blake’s in my own creative work. It is a union, an homage, and the continuation of tradition. Most importantly, it spreads even further the work of a great visionary Master. The world needs more poets and men like William Blake and with this adaption I hope to delight those that know him and introduce him to those that yet do not. Enjoy! 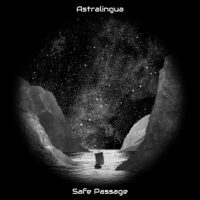 Astralingua’s upcoming album Safe Passage is released on March 8th, 2019. It is now available for pre-order at Bandcamp.